Rak-A-Van kits are an ideal way to get a vehicle organised quickly. One has to select the kit that is right for them and their vehicle. The product range can be altered if required. Kits include all fixings for standard installation (Mitsubishi L300, Ford Econovan, Mazda E-series, KIA Pregio). Supplied only unassembled or installation can be arranged at the workshop or customers workshop too. 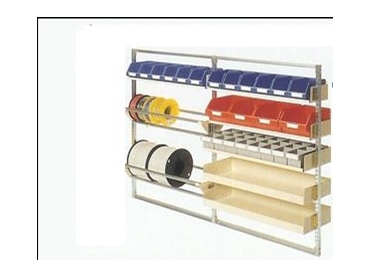 Rak-A-Van kits are available from Display and Storage systems .